Approximately 3,000 species of snakes inhabit divergent habitats on every continent, except Antarctica. With their silent, slithering locomotion and volatile defense reactions, snakes generate somewhat disproportionate levels of fear in many people. However, most snakes prefer to avoid human interaction, content to focus on their own lives -- basking in the sun, digesting a nice meal and, of course, bringing more snakes into the world. The advent of sexual maturity in snakes depends as much on their size, nutrition and overall health as it does on age. On average, most healthy, well-fed snakes reach sexual maturity between 2 to 3 years old. There are exceptions; for example, Burmese pythons typically reach sexual maturity between 4 to 5 years of age, and black rat snakes aren't ready for parenthood until they are at least 7 years old, some females waiting as long as 10 years to reproduce. Snakes produce offspring in three ways. Oviparous snakes lay between 2 to 50 eggs in a clutch. Females incubate their eggs either by burying them or by wrapping their bodies around the clutch to keep them warm. 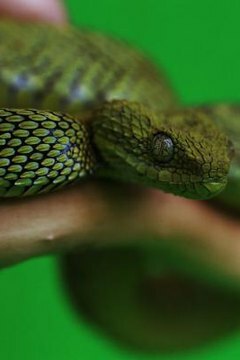 Viviparous snakes give birth to live young. Ovoviviparous females don't expel their eggs. Their eggs hatch inside their bodies and they give birth to live young. Most snakes have a specific breeding season that's activated by environmental factors, such as temperature, sunlight, food availability and rainfall. Laying eggs and carrying live young is physically taxing, so only females in good health with energy reserves are willing to reproduce. Snakes inhabiting cooler environments typically mate soon after emerging from hibernation in early spring, ensuring that their young are born during the warm summer months. However, for snakes inhabiting tropical regions, mating can occur year-round. During the breeding season, male snakes become aggressive and competitive as they search for mates. They fight with each other in grand shows of physical strength and dominance in order to gain the attention of females. In the end, however, the decision to mate is entirely up to the female snake. She may take just a few minutes to decide, or she may keep her suitors hanging for several days before her decision is reached. Not ones for sentiment, once mating has occurred male and female snakes part company. Males are typically focused on finding other females, and besides, females can become agitated and aggressive if the males hang around after mating. Oviparous females find a safe place to hide their eggs and incubate them, but that's the extent of their maternal care. Snakelets are left to hatch and fend for themselves, as are snakelets birthed by viviparous and ovoviviparous females. Newborn snakelets are fully formed and prepared to venture out on their own with no parental guidance. According to a study conducted by scientists at the University of Tulsa in Oklahoma, snakes are capable of asexual reproduction, or parthenogenesis. Previously thought to be a phenomenon specific to captive animals, the study revealed that wild female snakes, specifically copperheads (Agkistrodon contortrix) and cottonmouths (Agkistrodon piscivorus) can produce healthy offspring without mating.